Obviously I jinxed myself last week by saying I would write about Boston next, barring unforeseen difficulties. I have a laughable tendency of making grand statements and sweeping gestures that seem to invoke the wrath of Murphy's Law. The sweetest little girl cat featured here is my baby Schuyler (Pronounced Skyler. It's Dutch. ), and she has terrible allergies that have caused her to have to wear this ridiculous get up, which is a soft e-collar (a more pliable version of the cone-shaped hard plastic ones you sometimes see on dogs). She also is on a strict, bland smelling hypoallergenic diet that does not include any treats. Thankfully, Sky is not one to meow about her misfortunes. After all, she's a Jellicle cat! And, when she's not passed out on the couch, she's is very pleased to scare away the pigeons lurking around our new East Village windows, or corner roaches, or do running pirouettes after flies. Being a Jellicle cat, Schuyler has earned a number of names in the four years since I adopted her from a miserable caged existence at a Hell's Kitchen pet shop. Her name in full is, Schuyler Buddy Munchie Pookiebear La Rue Coleman, aka Schnookems, and sometimes Poindexter. Her mobster name is Baby Cakes, aka Cakes, Coleman. Her Native American name is Schuyler One Paw. And this morning at about 3 a.m., she earned her newest moniker: Mouser. Yes indeed, Little Miss Kitty began making some horrific noises just after Jon and I drifted off last night. My dad informed me today that cats can make 200 different noises, and this particular one was a note of primal instinct mixed with a little mommy, please get out of bed and come see what I've mauled for you, and don't worry I'm in just as much shock and have as little a clue of what do next as you. The whole incident was simply disturbing. In part because it's the second mouse in two weeks (the first surprised me when I went to open a Billy's Bakery box full of their delicious blueberry and banana chocolate chip muffins. That mouse had good taste! And seemingly more than one life, as it escaped. I wonder if mice prefer a sharp cheddar, or a creamy St. Andre?). But more so because after Jon and I came to and jumped into action by putting Sky in the bathroom and putting a clear, plastic bowl over the mouse, I had time to examine it before we disposed of it. It was just a wee baby, and its soft-looking fur was a precious light grey and pink. It had obviously been seriously hurt by Sky, because it couldn't get up or turn from its side, but its little back legs and tail were still moving, still trying to escape and live. To be so very close to a living thing struggling and fighting for its life on my living room floor after having been attacked by my cat was painfully hard and kept me tossing for hours afterwards. Supposedly, when a cat moves into an apartment, the word gets out in the mouse community and those smart little rodents take their after hours shriekfests elsewhere. 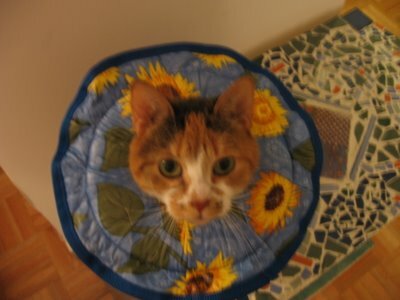 Hopefully, for our peace of mind and the very existence of the mice, they've already learned their lesson: don't mess with the sunflower bedecked kitty! Photo: Mouser Coleman in her former (bug and rodent free) Chelsea abode.